All coaching qualifications are essentially getting a new start-date to their qualifications, coaches should not be under any pressure to get their qualifications renewed. Development 2 is not considered a ‘certification’ by Hockey Canada or the CAC. These coaches will show as D1 ‘Certified’. Coaches enter into a ‘stream’ of coaching by taking part in clinics that are relative to the athletes that they are working with. Below are suggested entries for Coaches. Within the Hockey Canada structure the Community Coach Stream and Competition Introduction Stream are delivered at the provincial level, i.e. ALLIANCE Hockey. Competition Development Streams are delivered by Branches in conjunction with Hockey Canada and/or through Hockey Canada. The following three charts detail the three main streams of hockey that athletes move through in their development. The new NCCP model attempts to mirror this athlete model with the coaching development model to ensure that coaches are being educated with the necessary tools to meet the athlete’s needs. To know what course is right for you, please contact your local Association as they will be able to direct you to those courses that match their requirements for Coaches. Community Coach Clinic focuses on getting your players moving in the right direction and enjoying themselves while being introduce to the game of hockey. You will learn the fundamentals of being a positive role model towards your athletes. Upon completion of this clinic you will be considered ‘Trained’. To receive Community Sport – ‘Certified’ status you will need to complete the clinic Post-Task assignment, the Making Ethical Decisions (MED) – Community Sport Online Evaluation. The Development 1 Clinic is designed for coaches working with players that are engaged in competitive levels of hockey. Learn to motivate and lead your athletes as they movie into a competitive environment. Build age-appropriate and competition specific practice plans while you give your players a solid understanding of the skills and strategies they need to compete. You will also learn to analyze your player’s abilities to ensure that they’re equipped, both mentally and physically, for a more intense level of play. This is a 16-hour in-class clinic, hosted over 2 days with on-ice session. After completing this clinic you will be considered ‘Trained’. To become Development 1 – ‘certified’ you need to complete the Clinic Post-Task assignment, Making Ethical Decision (MED) Comp Intro online evaluation. 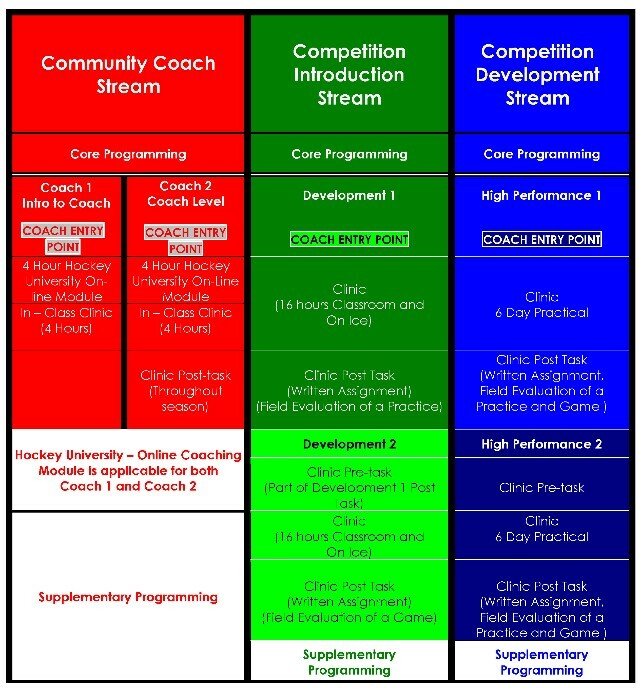 The High Performance 1 Coaching Program is an enriched development experience for coaches, which features in-class sessions, a written assignment and a field evaluation. The in-class seminar will provide an exceptional opportunity for coaches to learn as it will feature outstanding presenters who have vast experience within high performance coaching environments. Following the in-class portion, coaches will further their development by completing, and receiving feedback on, a written assignment with support from a mentor. Participants will then be provided with an incredible opportunity for growth as a Hockey Canada trained evaluator will observe a practice and game and conduct interviews on the ice sessions and the coach’s overall program. Throughout the process, coaches will be provided information and tasks which challenge them with the ultimate goal of furthering key skills including critical thinking, problem solving, interacting, valuing and leadership. The Locker will track your Professional Development points and will update the Hockey Canada Registry (HCR) Profile when ‘Certified’ status is renewed.